YouTube user Brandon Lund wanted to try stick welding cast iron so he simulated a crack on a dirty exhaust manifold. Cast iron exhaust manifolds are sometimes difficult to repair due to its brittle nature. Cast iron was developed as an alternative to wrought iron: cheaper but also inferior in tensile strength. Brandon chose to try stick welding cast iron, and he used Muggy Weld 77 and 72 electrodes to make the cast iron repair. 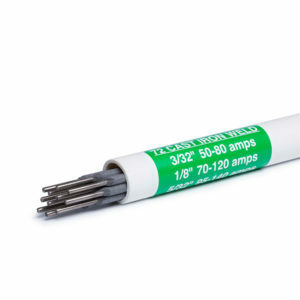 Muggy Weld cast iron electrodes do not require special pre-heating or cool down and this enables the user to make repairs without disassembling the cast iron part. To prepare the broken cast iron for welding, Brandon first used a grinder to expose the bare metal. He followed with a hand drill with a 3/16 drill bit to confine the crack. This will also prevent further cracking. Once the crack was contained, Brandon finished the prep. He beveled the cast iron with a disc grinder. Note: Brandon demonstrated the “spark test” to educate viewers how to determine whether a metal is steel or cast iron. Brandon used a Blue Demon 160 welder set at 60 amps, and 3/32” diameter rods. This cast iron exhaust manifold was heat affected (burnt). Brandon began the repair with the 72 rod then followed with the 77 rod. He laid deposits of only 1 inch at a time. After the first pass Brandon lowered the amperage to 50 to eliminate undercutting. This created a smoother deposit. 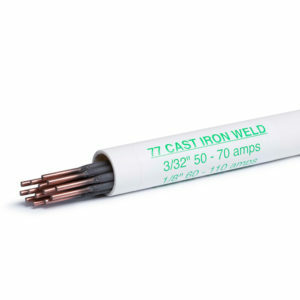 Muggy Weld 72 electrode is specially formulated to seal contaminates which may cause porosity. This allows the electrode to anchor deep into dirty cast iron. Once the 72 electrode was anchored in, Brandon completed the exhaust manifold repair with 77 electrode. 77 filled the cast iron and allowed for expansion and contraction of the parent metal post-weld. The end result was a crack-resistant weld that required no special pre-heating or cooling. This repair only a few inches of electrode.